A sad Karin here to say Farewell to There She Goes and share some inspiration for the sets that are still in stock. Did you see that all TSG stampsets are 50% off. If not you'd better rush to the store right away Before they are gone. I just checked and the adorable Poppy is still in stock - my advice is get her while you can!!!! Isn't she adorable??? And so much fun to color too!!! First I inked the background using distress ink and then colored her with some Letraset markers. I stamped her twice and cut her out. I saved the face and dress on one of the stamped images and then put the two together again using foam adhesive so that way I gor her to be a bit more three dimensional. I like the result and hope you do too. Wishing you all a wonderful Christmas and a very happy New Year!!! Hello There She Goes fans! Sarah here with my farewell and a little gift card pocket. I'm the last "new" design team member for There She Goes! It makes me so sad, but also incredibly thankful to Jessica and Jessie for giving me the chance to design with these fabulous stamps. I'm so proud to have been a Trendsetter. I needed to package up a little gift card, and the adorable stamps from Be Merry (still available at the time I wrote this) were perfect. I paper pieced the holly and added a little glaze pen to the berries. Simple, but so much nicer than giving a plain card! I wish you all a very Merry Christmas and a happy, healthy 2014! I hope to see you all in blogland! Before I say goodbye, here is one last project that will hopefully inspire you. 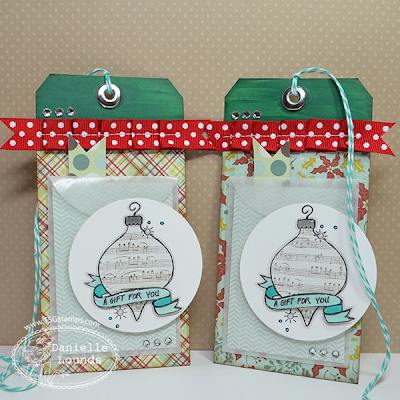 I used the Be Merry stamp set to create a couple of gift tags that also act as gift card holders. I needed a couple of gift card holders so I decorated a couple of tags. The small glassine envelopes hold the cards - I attached a flag to the gift card that can be used as a pull. Because the gift cards clash with my tags and I wanted to hide them a bit I lined the envelopes with a bit of designer paper. 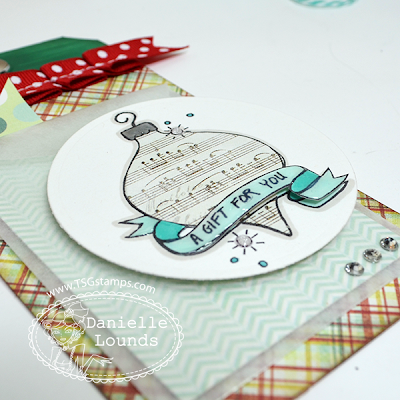 I stamped the ornament image on white cardstock twice and a third time on designer paper. 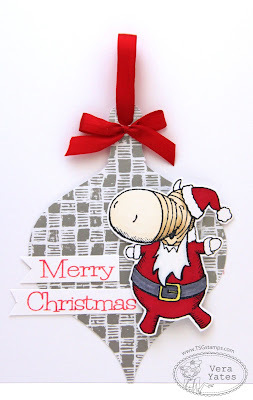 I paper pieced the body of the ornament and from the second piece of white cardstock I cut out just the ribbon portion of the image. On the ribbon I stamped the little "a gift for you" sentiment. I coated portions of the image with Glossy Accents and the stars with coated with Distress Stickles. I feel so lucky for the opportunity to have been a part of this fabulous team! Lots of hugs and thanks to Jessica, Jessie and all my teamies! Today I thought I'd share a super quick way to make customized ornaments .For my ornament, I used an old ipod packaging case but you can also use clear Amac display boxes found in organizational stores. Stamp your image, color and cut out. Trim a piece of pattern paper to fit in the box. Adhere your stamped image to the pattern paper with foam adhesive. 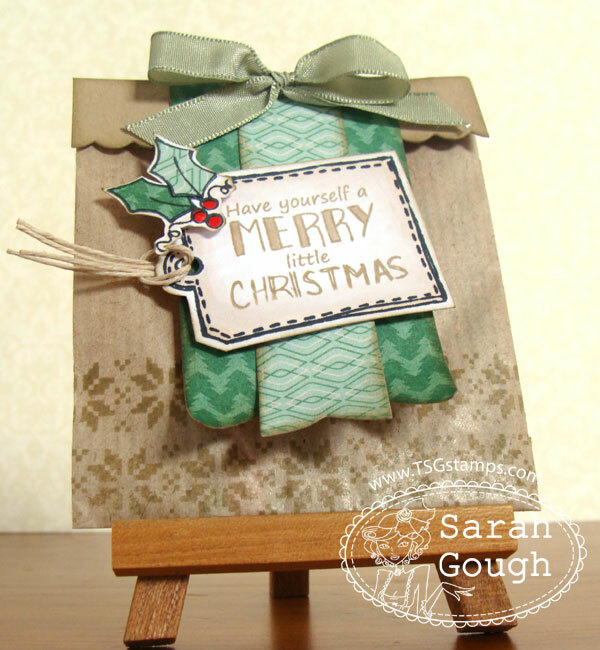 Decorate the back of the pattern paper with a sentiment or even a photo of the kids. Place pattern paper in box and close. 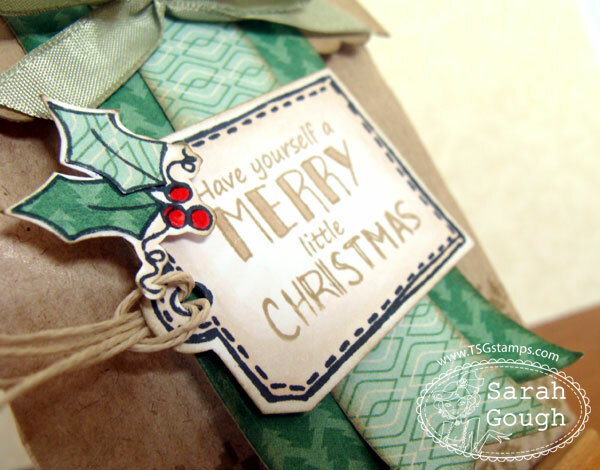 Wrap with ribbon and add twine to hang on the tree. Hi everyone. Vera's here today. It's my turn to do my farewell post. Sigh... this is so hard to accept. I still remember when I got the email to join the the team. I was so giddy when excitement. I've been a fan of TSG for years and joining the team was truly a dream come true. Thank you, Jessica for the opportunity. I love being part of TSG. I love the friends I met through this team. 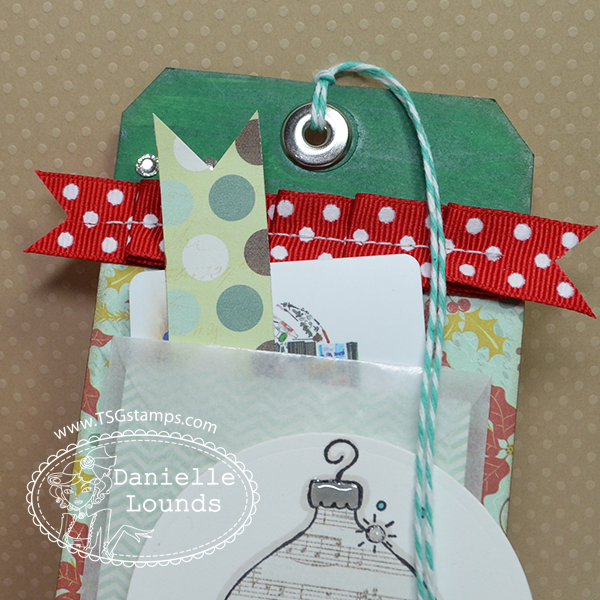 Well, before I get all sappy and melancholy, let me share this ornament/gift tag I made using Tis The Season set. This set is such a fun set to play with. I made this tag with double purpose. You can use it as a gift tag and once you give it away, the receiver can use it as ornament as well. I know all of us have our own favorite TSG set. As TSG closing it's door, let's walk down the memory lane. What's your favorite set? My favorite is Lucky Duck, followed by My Li'l Friend set. Thank you to all of you for your support for TSG and to Jessica, I wish you all the best. Hope you all have a blessed and beautiful holiday season. Merry Christmas!! Friends. It's cliche but oh-so-true, I have made some life-long friendships by serving on this team for so long, and I will cherish them always. THE STAMPS! They are amazing and I am so lucky that I get to flip through my wonderful collection of TSG for years to come. My own designs. I got to design a few stamp sets and what an incredible feeling that was! So for my farewell post I made a little altered frame. I hosted a choir party last night for my crazy students and my son got these crappy lucite picture frames. He was really sad so I traded gifts with him and thought "I'll do something crafty with them...." So I did! Doesn't look AT ALL like a cheesy picture frame any more! I used a new set called Be Merry (still in stock!! Get it while it's still available!!!) and coloured it with Copics. I added a few die cut snowflakes to give the project some dimension and that was that! Hey, guess what? The discount just got bumped up! Head over to the TSG Store to take advantage of the savings!! I couldn't believe it when I was approached about joining the Design Team for There She Goes stamps. The talent of the existing team was quite intimidating and I am still in awe of it after a little over a year of being on the team. I was honored to be included as a Trendsetter and to get to work with some very high quality stamps. As a final farewell with the closing of Jessica's shop, the Trendsetters will be sharing some Christmas gift giving ideas with you throughout the month. Just our way of saying thank you and happy holidays to all you TSG fans. For my project I have created a tea bag dispenser and used one of Wendy Leach's great sock critters as the main focal point. 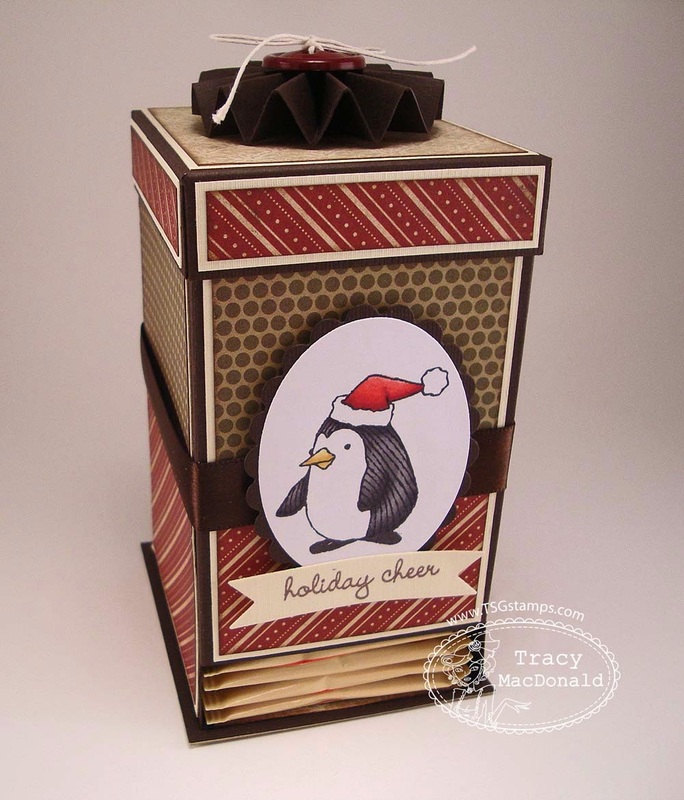 You can find a great tutorial for the dispenser right here on Splitcoast Stampers. I hope you all have a Merry Christmas and a wonderful new year to come. There She Goes Clear Stamps offer high quality photopolymer stamps in designs that you will love to use. From elegant to playful, we have something for everyone! Like There She Goes on Facebook! 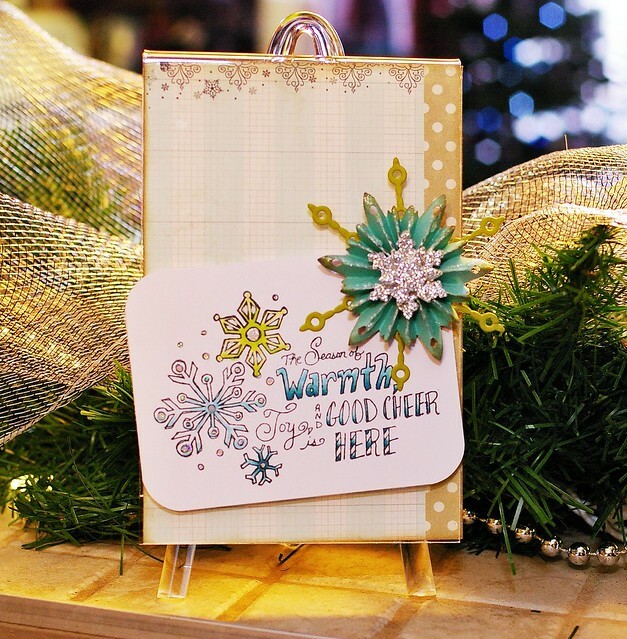 Discover new ideas for your TSG stamp sets! Want a TSG Blinkie or Icon? Click image! All content, including designs, concepts, text, and photographs are COPYRIGHT ©2011 by the artist. Original artworks are shared for your enjoyment and your inspiration only and may not be used for publication or design contests. Thank you so much for your support and for visiting the TSG blog! Have a fabulous day!